Wood, like all organic materials, will rot over time with exposure to the exterior elements. Water close to the base and or ice buildup are very hard on columns. The natural propensity for wood to act like what it was - a tree. Through osmosis, water is graduated upwards from the base of the shaft cell by cell to the top of the column. Even though the wood has been kiln dried, it still wants to be a tree again! As time goes on, the bottom of columns will absorb more water and will begin to rot; thus weakening the support of the columns. 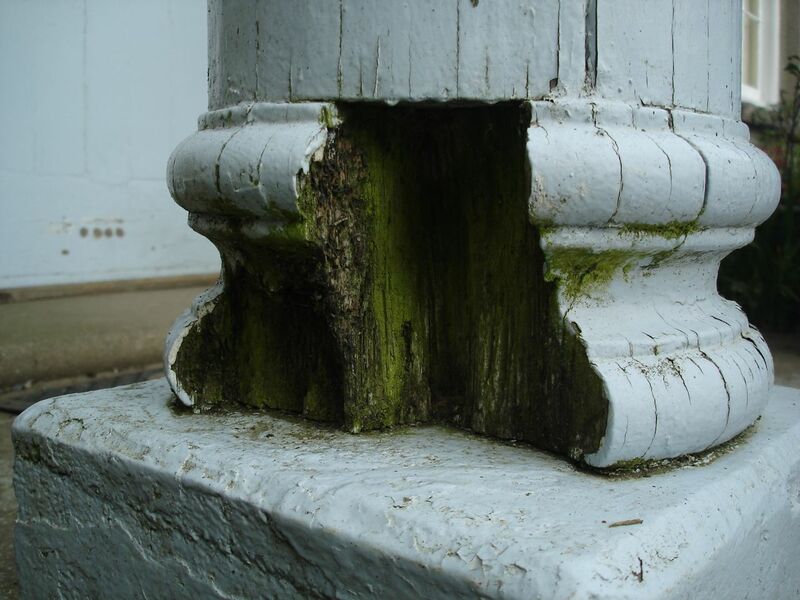 There is little that can be done to repair existing columns as the rot usually progresses extensively up the shaft. The type of wood is important as well. Pine works outside but a cedar or redwood is much better. Other species like maple or oak woods poor exterior woods. There are a few things you can do to make your columns last longer. If you are buying a wood column this is something you will definitely want to consider. Remember that rotting is far more likely on outdoor wood columns, but don't be scared to purchase wood columns as they can last a very long time with the right care and maintenance. This tends to provide a conduit for water to migrate up the shaft and thus weakening it prematurely. Instead of installing a solid base make sure that your base has ventilation slots and the column sits on top. Once the column is ready to install make sure that you prime and paint the shaft with 1 coat of primer and 3 coats of exterior oil-based primer and paint. Where oil-based products are banned use high-quality latex primer you can buy from a select paint store. Two coats is a good idea. Now paint with quality external paint. Air flow under the column can prevent rot from occurring. Air circulates under the column and up inside the column shaft is allowed by having a base that has ventilation holes already molded into the base. Typically if a wood base is used you will have an aluminum plinth underneath. If a polyurethane or synthetic base is used the base and plinth are one piece and the vent holes are molded into the part. In order allow the wood column to maximize air-flow it is important to make sure you have a recessed soffit. The column capital usually does not have ventilation holes on the top and thus the recessed soffit is the only method to ensure airflow. After installing the column to the soffit the capital should project out from the header. This is an opportunity for water to drain down into the shaft and it would be a great idea to bend a small piece of copper in a 90-degree angle and install on the top of the capital. If you keep a low profile on the vertical part of the flashing it should be completely hidden.